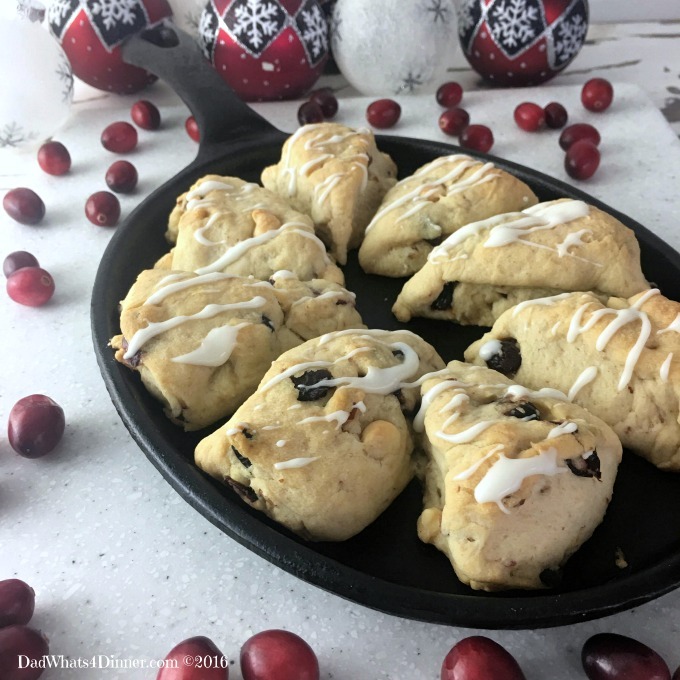 Cranberry White Chocolate Scones are the perfect treat for Christmas morning or anytime of the year. Flaky, sweet and tart all in one bite-size scone! I love to make and bake for people during the Christmas season. I think all food bloggers are that way and we love to see others enjoy our food. Every year we host Christmas Day brunch at our house. This was great when the kids were younger and the tradition has continued. Everyone in the family contributes to the feast. 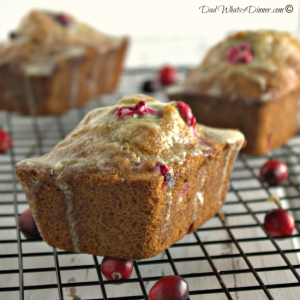 I always make some kind of breakfast bread like my Maple Bacon Cinnamon Rolls or Cranberry Eggnog Christmas Bread. 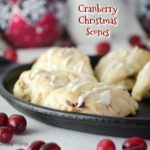 This year I decided to make these wonderful Cranberry White Chocolate Scones. The scones are tart, but not too sweet and a cross between a biscuit and a cookie. To make my Cranberry White Chocolate Scones, first sift together the dry ingredients. I use my Cuisinart food processor with the mixer blade attachment to mix and cut in the butter by pulsing the processor on low setting until the mixture resembles coarse crumbs. You can also use a pastry cutter to do the same thing. 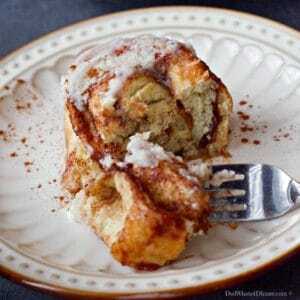 Mix in heavy cream and orange juice until a dough forms and holds together. 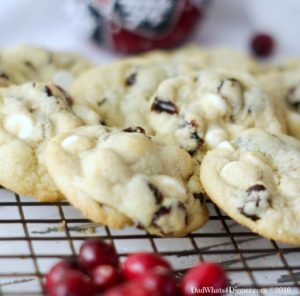 Stir in cranberries and white chocolate. Turn dough out onto a floured surface and knead 5 to 10 times until dough is smooth then divide dough into 8 equal pieces and shape each piece into an 8-inch log. Cut each log into 4 (2-inch) pieces; cut each piece in half diagonally to form small triangles. 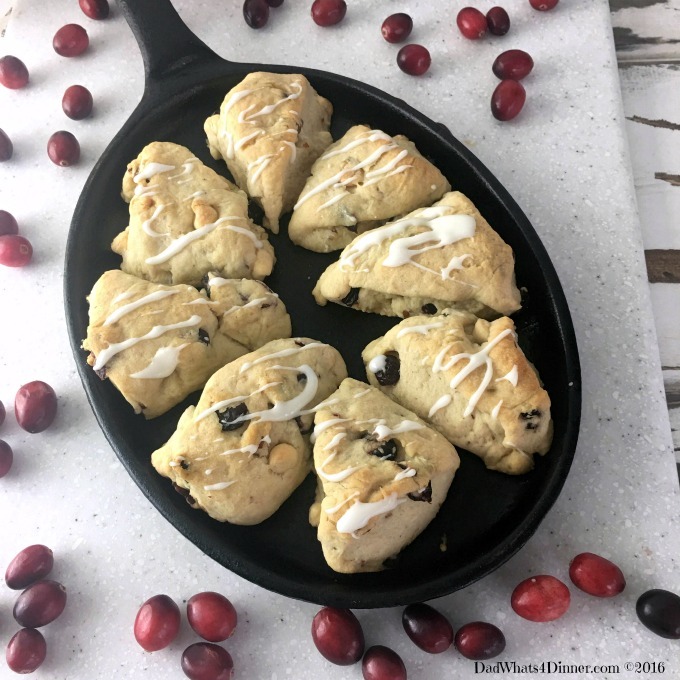 Place scones, at least 1 inch apart onto an iron skillet or un-greased baking sheet. I baked mine in both and the iron skillet gave the scones a little more crunchy bottom. Bake 11-13 minutes or until golden brown around edges. Cool completely before combining the remaining 3/4 cup white baking chips and shortening in bowl. Microwave on 50% power for 30 seconds; stir and continue microwaving and stirring every 30 seconds until chips are melted and smooth. Drizzle the scones with melted chocolate. The recipe can be cut in half or made into full-size scones. If making full-size scones increase cooking time to 16-18 minutes or until golden brown around the edges. Cut in butter by pulsing until mixture resembles coarse crumbs. Stir in whipping cream and orange juice and mix until dough holds together. 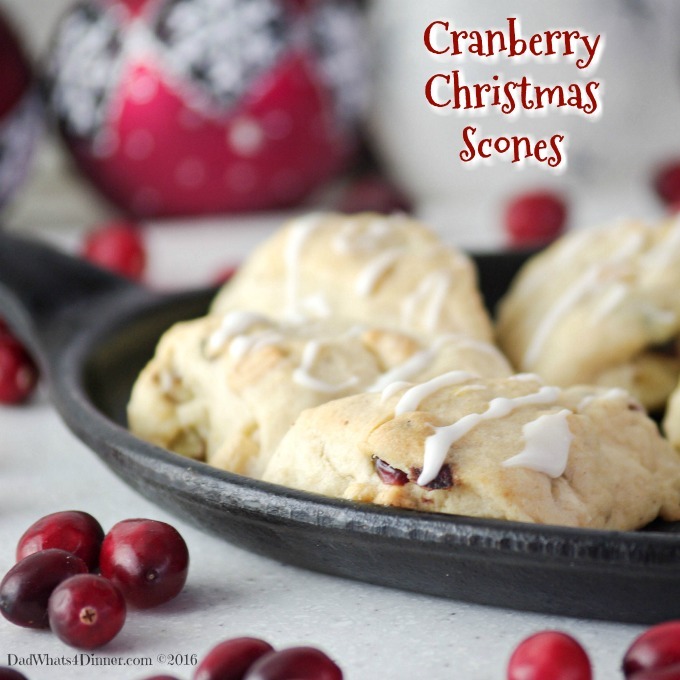 Stir in cranberries and 1 1/2 cups white baking chips. Turn dough onto lightly floured surface and knead 5 to 10 times or until dough is smooth. Divide dough into 8 equal pieces and shape each piece into 8-inch log. Cut each log into 4 (2-inch) pieces; cut each piece in half diagonally to form small triangles. 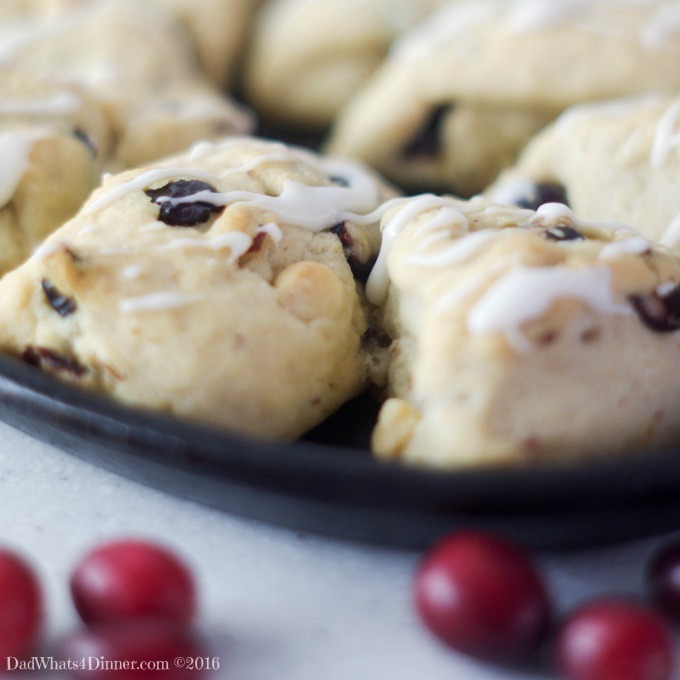 Place scones, at least 1 inch apart, onto an iron skillet or un-greased baking sheet. Bake 11-13 minutes or until golden brown around edges. Combine remaining 3/4 cup white baking chips and shortening in bowl. Microwave on 50% power for 30 seconds; stir. Continue microwaving and stirring every 30 seconds until chips are melted and smooth. Drizzle scones with melted chocolate. 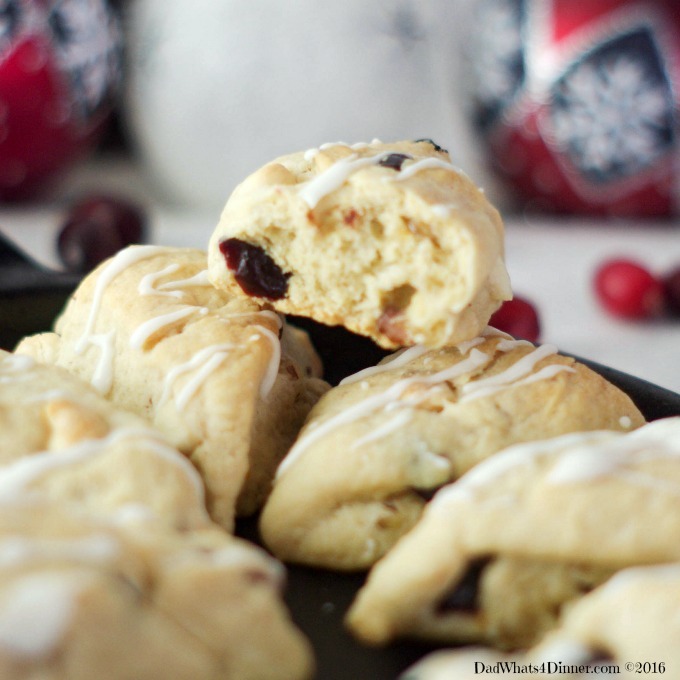 I will be bringing my Cranberry White Chocolate Scones recipe to Freedom Fridays, Friday Favorites, Fiesta Friday, Weekend Potluck, What’s Cooking Wednesdays. Checkout my Link Parties page for other great places to find new recipes.